Physicists at the University of Hamburg managed for the first time to individually write and delete single skyrmions, a knot-like magnetic entity. Such vortex-shaped magnetic structures exhibit unique properties which make them promising candidates for future data storage devices. Skyrmions have been in the focus of active research for the last years; however, up to now these states have been merely investigated, a controlled manipulation has not been achieved. Now this has been realized by scientists from the group of Prof. Roland Wiesendanger in Hamburg, Germany. As Science reports online on August 8, 2013, the creation and annihilation of single skyrmions, corresponding to writing and deleting of information on a storage medium, has been demonstrated by these researchers. This work solves one of the longstanding technical problems concerning the future use of skyrmions in information technology. Future electronic devices are expected to become smaller while increasing their data storage capacities at the same time. This will soon bring classical storage technologies to their physical limits. In conventional memory devices used up to now, magnetic bits consist of many atoms with their magnetic moments aligned parallel to each other like bar magnets. Pointing in defined directions, they can represent the values "1" and "0" which are the basis for information technology. With the continuing miniaturization, the interaction between neighboring bits increases due to magnetic stray fields which can lead to loss of data. In addition, small magnetic bits are less stable against thermal fluctuations which is also called the superparamagnetic limit. 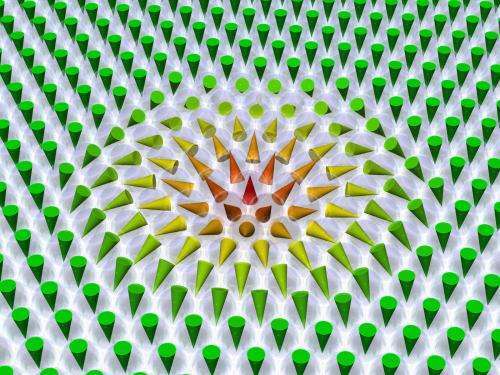 Using more "robust" magnetic structures like skyrmions could be a way out of this technological dead end. These structures can be imagined as a two-dimensional knot in which the magnetic moments are rotating about 360° in a plane with a unique rotational sense (see Fig. above). These particle-like magnetic knots can be assigned a kind of charge, the topological charge. With this it is possible to assign the bit states "1" and "0" to the existence or non-existence of a skyrmion. A clever choice of temperature and external magnetic field enabled the scientists of the group of Prof. Roland Wiesendanger to prepare and manipulate single magnetic skyrmions for the first time. They used a two atomic layer thick film of palladium and iron on an iridium crystal. In an external magnetic field this sample exhibits single localized skyrmions with a diameter of a few nanometers that can be imaged in a spin-polarized scanning tunneling microscope. 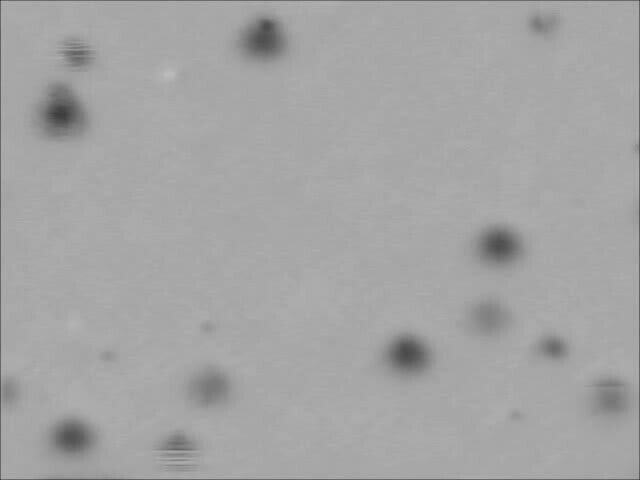 Using small currents from the tip of the microscope these skyrmions can be written and deleted. For the creation the previously parallel magnetic moments are twisted to form a knot-like magnetic state, and for the deletion this knot is unwound again. "We finally found a magnetic system in which we can locally switch between ordinary ferromagnetic order and a complex spin configuration", says Dr. Kirsten von Bergmann, senior scientist in the Wiesendanger group. As published in the current issue of the Science magazine, four skyrmions were specifically addressed and could be created and annihilated. "We transferred the idea of tying a knot to memorize something to the field of storage technology so we can now store data in a two-dimensional magnetic knot", explains Ph.D. student Niklas Romming. Whether skyrmions will be used as data storage units in our computers, tablets, or smartphones, is not foreseeable. 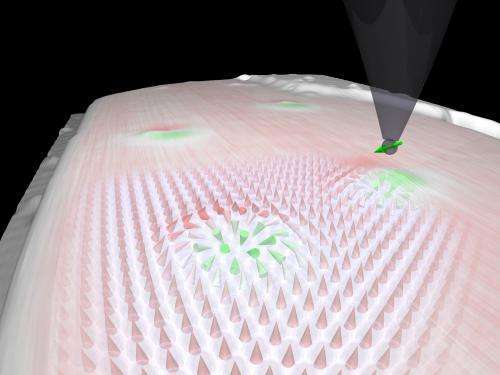 The experimentally accomplished writing and deleting of skyrmions, however, has demonstrated the feasibility of this technology and paved the way towards a realization of such devices. This topic has nothing to do with global warming. Or are you just reminding us that once one has a PhD in some particular field, one can speak with authority on all matters. Applying topology to real world problems. Elegant. I wonder what the minimum number of atoms for a skyrmion is in a 2D or a 3D configuration (i.e. what the theoretical maximum data density would be). ...are you just reminding us that once one has a PhD in some particular field, one can speak with authority on all matters. Lubos, the Harvard trained Ph.D. physicist, and myself, the Columbia/Harvard trained Ph.D. chemist, can speak *very* competently about most any science after a season or two of delving into recent publications. Physics and chemistry are not just "some particular field" like climatology indeed is. You know this. Everybody knows this. That billions of dollars are being stolen from physics and chemistry departments to fund agenda driven Global Warming pseudoscience means that very much so does this topic have something to "do" with it! Because you are a gorebot, you cannot fathom that my single sentence post was an altruistic addition of factual information about the nature of my link! gorebot: BORG-like, half human, half wind-up toy supporters of Al Gore. See also Demonic kooks. So shut up, gorebot, you're wasting people's time. Keep beating that drum. Someday maybe even you will believe it. Apparently "Ph.D." is, again, a magic "I am right" club to be wielded indiscriminately in defense of personal opinion.